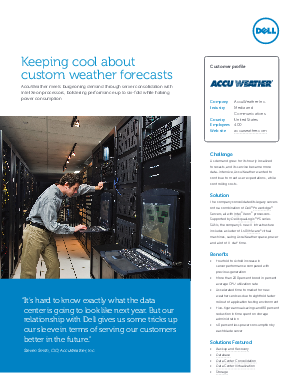 As demand grew for its hourly localized forecasts, and its service became more data-intensive, AccuWeather wanted to continue to meet user expectations, while controlling costs. The company consolidated its legacy servers onto a combination of Dell ™ PowerEdge™ Servers, all with Intel ®Xeon® processors. Supported by Dell EqualLogic ™PS series SANs, the company’s new IT infrastructure includes a cluster of 150 VMware ®virtual machines, saving AccuWeather space, power and a lot of IT staff time.